What Does the Top Russian Orthodox Priest, The Pope and S.S. Skull and Bones Have in Common? Yale University (why is a secret society allowed for over one hundred years on campus?) Secret Skull and Bones Society include Bushes and Kerry’s as members. 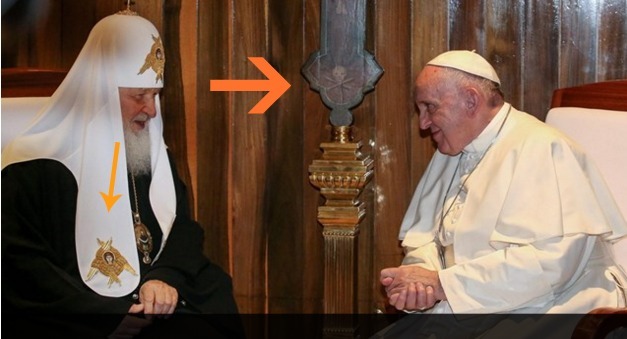 note: Freemasonic symbolism on Russian Orthodox Patriarch and Skull and Bones logo between the two as they met recently in Cuba where the Jesuit trained Castro’s still rule. All the Same Team; Russian Orthodox High Priest, Jesuit Pope Francis meeting in Cuba where Jesuit trained Castro still holds power. You simply cannot make this shi-te up!~! There was a time not long ago that I believed there really was a divide between the east and west. There was a time not long ago that I believed Russia was the antithesis of the United States and in all outward appearances it seems that way. The alt-press has trumpeted Putin and Russia as the NWO killer and primary bulwark against western hegemonic aspirations. Again, it all looks that way on the surface, but beneath the gentle ripples of the Caspian Sea, the NWO has a firm grip on Mother Russia. The picture below is worth more than a thousand words…. Jesuits Run the World. Period. If this doesn’t convince you, then please read the links below with many articles chronicling their control of world events for hundreds of years. Did you know Fidel Castro is a full-blown Jesuit? Did you know the Bay Of Pigs was a Jesuit operation? Did you know that CIA director Allen Dulles, a Knight of Malta and Nazi-protector, backed Castro calling him “the Abraham Lincoln of Cuba”? Did you know that the Bolshevik Revolution that killed 30-60 million ethnic Russians was created in the Bronx (NY) by the Jesuits? Did you know the Cold War was a Jesuit-engineered psyop? Did you know that both Russia and the U.S. were working together on Operation Fishbowl from ‘1958-1962’ during the supposed Cold War? Did you know that Russia and the U.S. are both identical signatories to the Antarctic Treaty in 1961, during the supposed Cold War? Did you know that Russia and the U.S. staged the Cold War collapse together to eventually destroy America? Did you know that Russia’s SURA Program is the equivalent to the U.S.’s HAARP program but much more powerful? If Russia was truly anti-NWO how come not a peep about the geoengineering above their skies? Why does the U.S. buy Russian RD-180 rocket engines? Why did the U.S. buy dozens of Russian MI-17 Helicopters for the Afghan Army? Do you find it interesting that Judge Antonin Scalia (jesuit-trained) was murdered the day after on the occult Lupercalia day (Valentines Day)? Does all this make you feel that the U.S. and Russia are playing Punch and Judy? The New World Order is alive and well, hang onto your hats! Satan On The United States Dollar — The Masonic Seal Of America! The picture. 1. The symbol on the scarf down of the Patriarch Cyrill is embroided seraphim – angel with 6 wings covering legs, body and head, and the visible part is only the face of the seraphim as it’s traditionally represented in Orhtodox Church (not only Russian). 2. 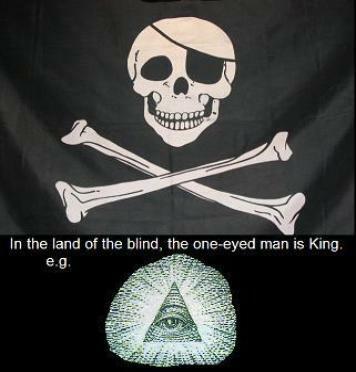 The skull and bones are the symbol of the death which is defeated by the Ressurection of Christ as it’s said in the (orthodox) troparion of the feast. It is painted usually on the down part of the main wooden Cross in the legs of Christ, also on the Icon of the Ressurection of Christ. Your’s explanations are far away from the truth. Seriously! 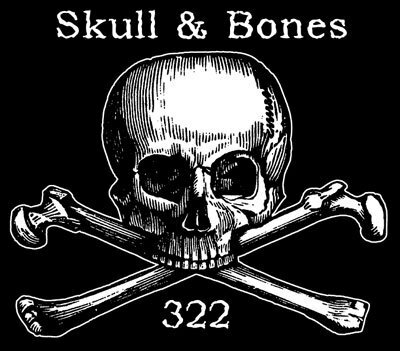 And what about 322, the Elite Yale Skull and Bones numerology.